Cooks caught eight of 13 targets for 120 yards during Sunday's 13-3 loss to the Patriots. Cooks brought in seven of eight targets for 107 yards during the Rams' 26-23 overtime win over the Saints in Sunday's NFC Championship Game. 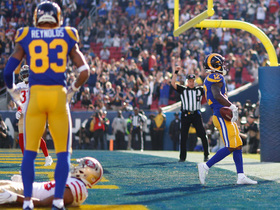 Analysis: Cooks ended up as the Rams' most effective receiver versus his old squad, with his exploits key to Los Angeles' upset. The 2014 first-round pick's contributions were especially crucial on a day when the Saints effectively limited fellow wideout Robert Woods, especially downfield. 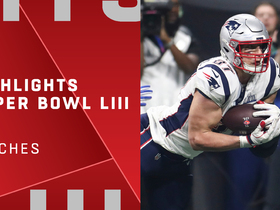 Cooks' elite speed, which he flashed on a pretty 36-yard over-the shoulder grab Sunday, could once again prove pivotal to the Rams' chances against either the Patriots or Chiefs in the Super Bowl. Cooks corralled four of six targets for 65 receiving yards during Saturday's 30-22 win against the Cowboys. He had a would-be touchdown reception called back on instant replay during the second quarter. Cooks caught five of nine targets for 62 yards and two touchdowns in Sunday's 48-32 win against the 49ers. Analysis: Cooks was without a touchdown reception since Week 9 against New Orleans, so it was good to see him finally break out, though that's of little solace for fantasy owners. The 62 receiving yards also tied the 25-year-old's highest yardage total in the last five games. The Rams were able to secure a first-round bye with the victory and will host a divisional-round game Jan. 12 or 13. 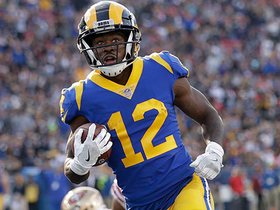 Cooks brought in all three of his targets for 35 yards and rushed three times for 27 yards in the Rams' 31-9 win over the Cardinals on Sunday. Analysis: Cooks didn't make much of an impact through the air, but the sum of his efforts was solid overall. The speedster also took an early seat once the Rams had the game in hand in the fourth quarter, and Cooks has now failed to top 62 receiving yards over his last four contests following a three-game streak of 100-yard efforts from Weeks 9-11, a matter he'll look to rectify when he tries to help the Rams secure the No. 2 seed and a first-round bye in Week 17 against the 49ers. Cooks caught six passes (seven targets) for 59 yards in Sunday's 30-23 loss to the Eagles. Cooks had three catches (seven targets) for 22 yards in Sunday's 15-6 loss to the Bears. Cooks brought in four of six targets for 62 yards in the Rams' 30-16 win over the Lions on Sunday. 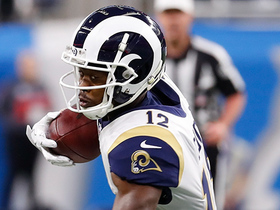 Analysis: Cooks checked in second behind Robert Woods in receptions and receiving yardage on the Rams for the afternoon while also recording a game-high 26-yard grab. 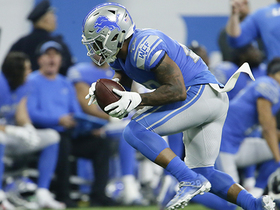 The fifth-year speedster did see his three-game streak of 100-yard efforts come to an end, and he was the intended receiver on a deep second-quarter pass that was intercepted by the Lions' Quandre Diggs. Cooks will look to boost his overall numbers back to their usual stellar levels in a tough Week 14 showdown against the Bears. Cooks caught eight of 12 targets for 107 yards in Monday's 54-51 win over the Chiefs. 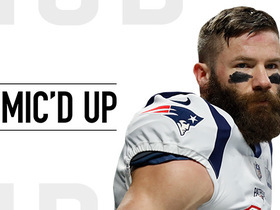 Analysis: Cooks briefly visited the locker room while dealing with cramps, but that didn't prevent him from returning to action and finishing with another stellar outing. Despite not scoring, the wideout led Los Angeles in all major receiving categories, hitting the 100-yard mark for the third straight game. As the most explosive option in a high-octane passing attack, Cooks continues to deliver in a big way and will hope to keep his momentum when the Rams reconvene following their Week 12 bye. Cooks is dealing with cramps and is questionable to return to Monday's contest against the Chiefs, Rich Hammond of The Orange County Register reports. Analysis: Cooks headed back to the locker room early in the third quarter due to cramps. If he is unable to return, look for Robert Woods and Josh Reynolds to see the majority of reps at wide receiver. Pharoh Cooper was activated off injured reserve before the contest and could also see increased action should Cooks not return. Cooks hauled in 10 of 12 targets for 100 receiving yards, adding a 9-yard rushing touchdown during Sunday's 36-31 win against the Seahawks. Cooks caught six of eight targets for 114 yards and a touchdown during Sunday's 45-35 win over the Saints. 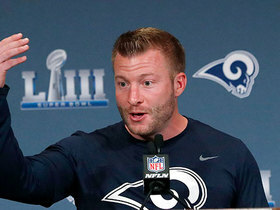 Los Angeles Rams head coach Sean McVay shares his thoughts on wide receiver Brandin Cooks and what he means to the team. 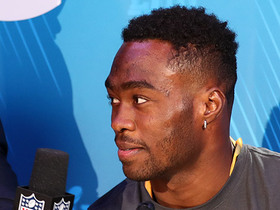 NFL Network's Nate Burleson catches up with Los Angeles Rams wide receiver Brandin Cooks at Super Bowl LIII Opening Night. 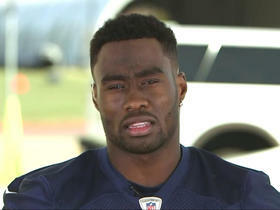 Los Angeles Rams wide receiver Brandin Cooks joins "NFL Total Access" to talk about the team's NFC Championship matchup against the New Orleans Saints. 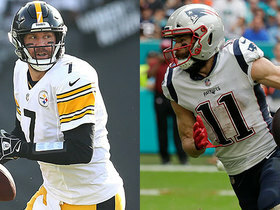 NFL Senior Fantasy analyst Michael Fabiano discusses which quarterbacks and wide receivers you should start and sit for Week 15. 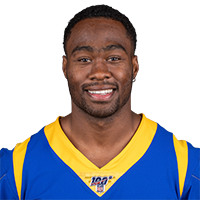 Los Angeles Rams quarterback Jared Goff lofts beautiful sideline pass to wide receiver Brandin Cooks for a solid 26-yard gain.